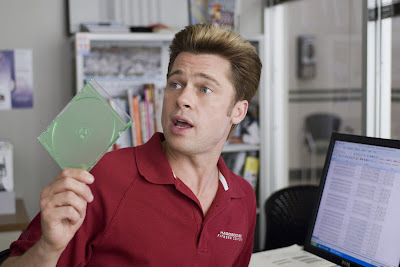 Here's the trailer for the Coen Brothers' upcoming film, Burn After Reading, scheduled to open on September 12th. This one should be less in the vein of their Oscar-winning No Country for Old Men, and more like Raising Arizona. It's about two gym employees who try to blackmail an ex-CIA official after finding his diary. The stellar cast includes George Clooney (Leatherheads), Brad Pitt (Babel), Frances McDormand (North Country), John Malkovich (Eragon), Tilda Swinton (Michael Clayton), and Richard Jenkins (Six Feet Under). Click on the picture above for a look at the trailer, and let me know what you think.